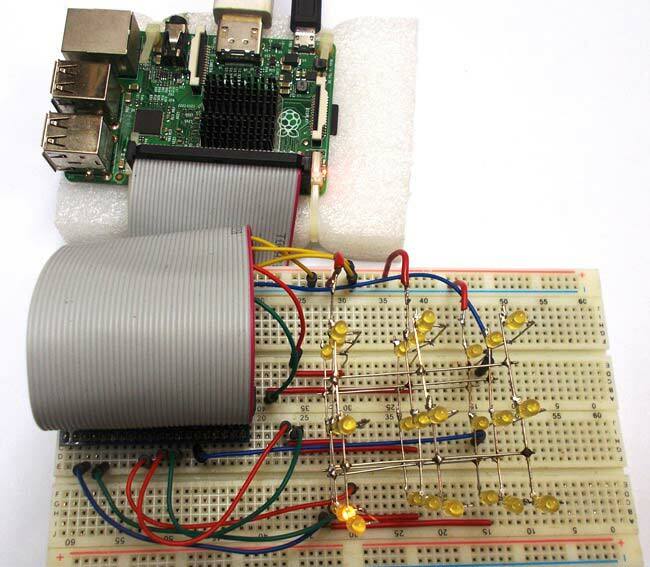 We have created a series of Raspberry Pi Tutorials, in which we have covered Interfacing of Raspberry Pi with all the basic components like LED, LCD, button, DC motor, Servo Motor, Stepper Motor, ADC, shift Register, etc. We have also published some simple Raspberry Pi projects for beginners, along with some good IoT projects. Today, in this session, we are going to make a 3x3x3 LED CUBE and control it by Raspberry Pi to get different patterns using the Python Programming. We have previously build the same 3x3x3 LED Cube with Arduino Uno. A typical 3*3*3 LED cube connected to Raspberry Pi is shown in the image above. This LED CUBE is made of 27 Light Emitting Diodes, these 27 LEDs are arranged in rows and columns to form a cube. Hence the name is LED CUBE. Power supply demand is less. Best suited for +3.3v logic operated electronics like Raspberry Pi. We have previously discussed the building of 3*3*3 LED cube in detail in this article: 3x3x3 LED Cube with Arduino. You should check this one for learning how to solder LEDs for forming LED Cube. Here we are mentioning 9 Common positive terminals (columns) and 3 common negative terminals (Negative Rows or layers) in LED Cube. Each column represents a positive terminal and each layer represents a negative terminal. We can see 9 Common Positive Terminals from the Top View as numbered in the below picture, we have numbered them as per the GPIO pin no of Raspberry Pi, on which these positive terminals are connected. Once everything is done you will have a cube like this one. Also check the Video given in the end. As shown in picture, we have a total of 12 pins from Cube, over which NINE are Common Positive and THREE are Common Negative Pins. Remember each column represents a positive terminal and each layer represents a negative terminal. Now we will connect these 12 pins to Raspberry Pi exactly as given in the circuit diagram. Once we have connected the terminals it’s time to write the PYTHON program. You can check the Python program below to generate the pattern shown in the Demo Video below. Say, we want to turn on LED on the middle layer as indicated in below picture (red circled), then we need to power the GPIO18 pin and ground the GPIO6 pin. This goes for every LED in the cube. We have written couple of loop programs in PYTHON to make simple flashes. Program is well explained through the comments. If you want more patterns you can simple add more patterns in to the program.